The saga around the 439 Powell building saddens me for many reasons (mainly the loss of another heritage building, coupled with the hardship it has caused the tenants), but I think that people are rushing to put the blame on the city due to a hidden agenda. The reality is that at the time of the initial collapse, or partial collapse, there were still tenants living in the building next door and it (439 Powell) was thought to be intact, perhaps it still was. Given the option of trying to salvage a partially collapsed building and risk destroying a second, the city chose to demolish one to mitigate any further damage. As it turns out, the engineering department has found too much structural damage to 439 (perhaps as a result of the demolition) and has now ordered it to be demolished as well. The Ming Sun society is now stuck in a bad position with the insurance companies representing both buildings arguing over who is liable for all of the damages. I am by no means a Vision Vancouver supporter, and do agree that they are far too cozy with developers, but to put the blame on a conspiracy rather than incompetency coupled with bureaucracy seems a bit far fetched. But who knows. 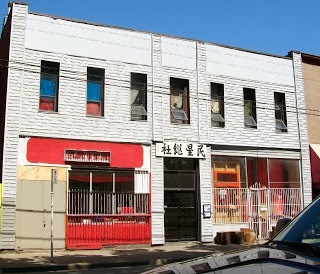 Either way, Powell Street will not be the same without the quirky grey building that has seen more than we can imagine. I toured the building on Friday and it is in far better shape than the what’s been presented and is better than many I’ve been in and it’s in way better condition than a few houses I’ve seen saved and restored. The floors are dead straight, walls are in plumb and the building has been well maintained. The issue stems from the exterior, non-structural brick walls of the front building which did need repair, but the timber frame is in very good shape. There should be no reason to demolish this building, there should be a way to facilitate the restoration of such an important building. I don’t know anything about construction or structural engineering, so I was just going on the report from the engineering department. If it is salvageable (within a reasonable price) then, yes I fully agree with you, there should be no rush to tear down the building.